Craig Pustejovsky joined CCMC in 2014 as community manager at Sonoran Foothills. He soon transitioned to the role of community manager at Vistancia, where he helped oversee transition from developer to homeowner control, led efforts to ensure financial stability and fully fund the community’s reserves, and oversaw a vibrant and successful lifestyle and communications program. He was promoted to the role of vice president in 2018. 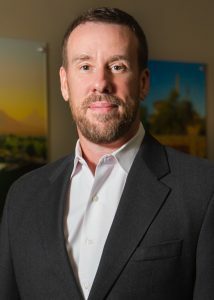 Prior to joining CCMC, Craig served as vice president of a national community management company based in Arizona, adding to his more than 10 years of industry experience. Craig served 10 years in the U.S. Marine Corps in a variety of leadership roles and was awarded the Navy Achievement Medal, Navy Commendation Medal and the Joint Service Achievement Medal during his service. Professionally, he holds the Certified Arizona Association Manager (CAAM) and Certified Manager of Community Associations (CMCA) professional designations and is currently pursuing his Professional Community Association Manager (PCAM) certification.